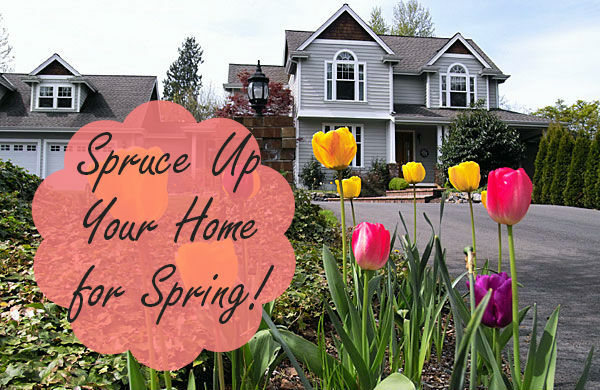 Spring is a season of invigoration and after a long, cold winter, most homes could use a touch up or two. Now is the time to give your home a thorough once over; follow these simple, effective ideas to get your home ready - inside and out - for the busy months ahead. Rent a steam cleaner, or hire a professional to give your carpets a good cleaning. You'll notice a huge difference! Maintain the freshly cleaned floors with regular vacuuming and spot treatments as needed. Take down drapes or curtains and wash or dry clean them. Dust your blinds and clean with a damp sponge to remove dust build up and keep allergies at bay. While you're at it, wash the glass inside and out and put screens back on the windows to let the fresh air in. Winter takes a toll on doormats both inside and out. Give your entryways a fresh new look for the warmer months and replace those worn out mats. It's important to test smoke alarms every six months and replace batteries as needed. An easy way to remember is to check at the beginning and end of Daylight Savings Time. Throw out (safely) old prescriptions and discard any expired products. Be sure to stock up on first aid supplies and anything you'll be using in the warmer months like sunblock, bug spray and aloe. Unfortunately, with warmer weather comes an influx of bugs and pests. Remember to store all food in airtight containers. Wash out your trash cans and recycling bin and remember to rinse all recyclables before tossing them. Use a pressure washer or garden hose to remove built up dirt and grime on the outside of your home. If needed, use a stiff bristled brush for an even deeper clean. 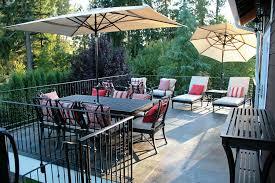 Spray down and sweep off your deck or patio and bring your outdoor furniture out of storage. After a long winter it will seem nice to relax in the warm sun! Make sure your barbecue is firing properly. If it's not working to its full potential, use a sewing needle to clear out any clogged burner holes. Using a mixture of equal parts vinegar and warm water, spray down the grates, close the lid and let sit for an hour before scrubbing off any residue. Don't forget to fill the gas tank so you'll be ready for the first barbecue of the season!